Recently I heard a sermon on “claiming the Holy Spirit.” As I was listening to the sermon, I found myself agitated. While everything the preacher said was technically correct, the sermon did not resonate with me. I started to wonder if the Spirit was a gift or a conquest. At the heart of the sermon was the idea that if we claim the Holy Spirit, we could have power. Our perceived lack of power in the present is because we are not claiming the Holy Spirit. The congregation seemed to love the sermon. The idea of having power sounds appealing. Who wouldn’t want life changing power in her or his ministry? The prooftext scripture lesson was Acts 1: 6-9. What I found most problematic is that I have a totally different understanding of the events surrounding Pentecost. Now I would not disagree that when the disciples received the Holy Spirit they received power. Jesus promises power in the scripture lesson and they receive it. My emphasis though would be on the idea of the Holy Spirit being a gift to be received. They did not claim the Holy Spirit. Peter did not raise a sword up like He-Man and say “I have the power” and then magically have power. Jesus followers did not say some magic incantation and unleash the Holy Spirit. John did not go on a vision question. Andrew did not perform some Herculean task to earn the Holy Spirit. We really are not sure what they were doing when they did received the Holy Spirit. The author of Luke/Acts did not think it was important to record that detail. When Jesus was preparing for his crucifixion, the disciples did not ask for the Holy Spirit. Jesus promised them the Holy Spirit unsolicited. After the ascension and before Pentecost, the disciples prayed, worshiped, discerned a new apostle, and spent time together in fellowship. They were told to wait and they did. Jesus earliest followers did not claim the Holy Spirit. The Holy Spirit claimed them. This claim appeared to come unexpectedly. As they were likely celebrating the gift of the law, God gave them a new gift. The Holy Spirit’s power was not requested, it was promised. They did not claim it, they received it. It was not earned. All the disciples did was to make themselves available to God and wait. We often think about power in the church. I sometimes think we envy the world’s power. Part of the pastor’s obsession with leadership as seen manifested in the business world, I contend, is the hope that the pastor might mine something from the powers of this world that could be used in ministry. Business leaders appear to have power, we want power, what is the secret? God’s power though is unexpected, unsolicited, and strange to the world. I do not think we can claim the Holy Spirit. We make ourselves available to the Spirit through spiritual disciplines and discernment. Our prayer should not be God give us power, but Lord make me an instrument of your will. 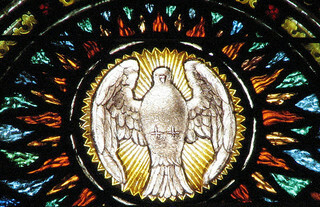 “Holy Spirit Stained Glass.” ©2007 Copyright hickory hardscrabble. Licensed Under Creative Commons.